In a large pitcher, combine the grapefruit juice, guava nectar and agave syrup. Stir well to combine. Taste for sweetness and add more agave as necessary. Pour the juice mixture over ice into glasses for serving, top with a splash of mineral water and serve with a grapefruit supreme and lime wedge. For the adults, pour the juice into an ice filled glass, add 2 ounces of tequila and a splash of mineral water. 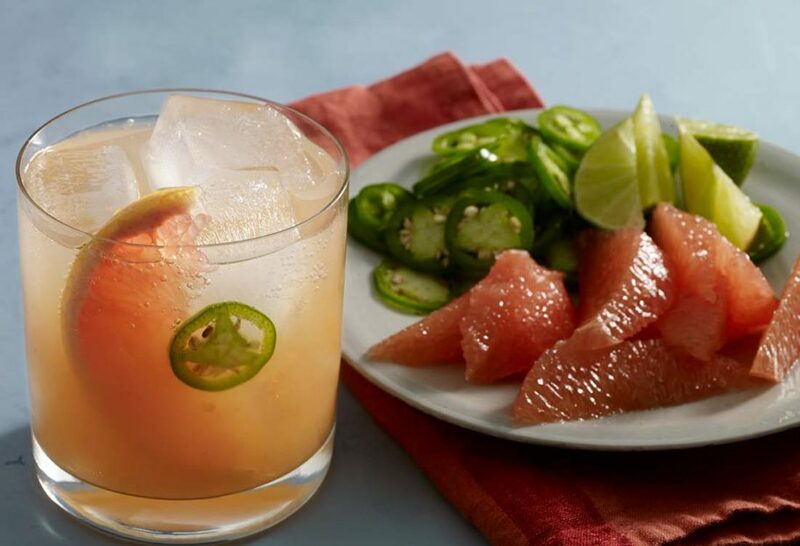 Garnish with a grapefruit or lime wedge and a fresh jalapeño slice and serve. I love to watch your shows. Just curious, when I saw this program the other day, I wrote down the tequila mamufacturer that you visited, and now cannot find the note. I was going to buy a bottle for a friend’s birthday. Oh it’s Casa Dragones. I hope your friend has a great birthday, Rob! Pati: saw your comments on this episode about produce managers being hard to get to know. Since you’re near DC, it made me think of the Eastern Market. While there are farmers on Saturday, T-S there are 2 excellent vegetable stands, one run by the Calimieras Family and one by the Soles Family. They will compete for your business. I wanted to make an avocado mousse for a Christmas party and Mr. Soles found and held onto 7 ripe avocados for me in December. Lovely people!! Oh I love Eastern Market! Thanks for sharing Betsy.